U-2 pilot awarded the distinguished Silver Star half a century after his release from a Soviet prison. The American pilot who unwittingly provoked major tensions between the United States and the Soviet Union in the midst of the Cold War will posthumously receive the Silver Star, the third-highest combat military decoration for valor. 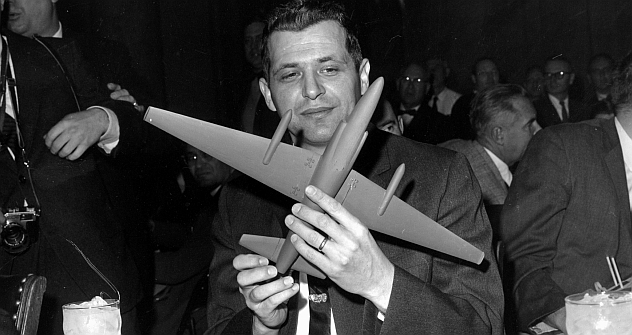 Francis Gary Powers, whose U-2 spy plane was shot down while on a reconnaissance mission on May 1, 1960, will be awarded the medal during ceremony at the Pentagon today, June 15. The event resulted in a major political confrontation between the two superpowers (involving the United Nations); spoiled the fragile personal relations between Nikita Khrushchev and Dwight Eisenhower; and contributed to the collapse of arms control talks between the United States and the Soviet Union. Powers was sentenced to ten years in prison. He spent 21 months behind bars in notoriously harsh conditions before a dramatic swap 50 years ago with the high-ranking Soviet spy Rudolf Abel in Berlin. U.S. Air Force Chief of Staff General Norton Schwartz will present the Silver Star to the members of the his family for “exceptional loyalty” while enduring harsh interrogation in the notorious Lubyanka Prison in Moscow. RBTH spoke to the son of the famous Cold War era pilot Francis Gary Powers Jr. who will accept the Silver Star medal on his father’s behalf. RBTH: Previous decorations– both POW and CIA Director’s medals - were delivered to your father almost twelve years ago. But what does the Silver Star mean to your family today? Gary Powers Jr.: Indeed previous medals were awarded to my father on May 1, 2000, on the 40th anniversary. But for me personally the Silver Star medal is an indication that he was a hero to our country, and it helps to set this record straight by dispelling misinformation, rumors and speculations about my dad. After 50 years, declassification conferences, books that have been written and information that has been released – all shows that he did what he was supposed to do under the circumstances. RBTH: Was it hard to go through the Pentagon’s bureaucracy to get the Silver Star award? G.P. : The declassification conference, which took place in 1998, showed that the U-2 flight was a joint Air Force and CIA operation…. And that is why he was awarded the POW medal. Then 10 years go by and I read newspaper article about two other pilots who have been shot down around the Soviet Union and were imprisoned in Lubyanka prison almost the same time as my father did. Based on that, in January 2011 I wrote a letter to the Pentagon and inquired what precedent does this set for my father. Ten months later, Pentagon’s notification confirmed that indeed that sets a precedent and he will be awarded the Silver Star posthumously in 2012. RBTH: Do you remember what your father told you about his days in the notorious Lubyanka prison in Moscow? G.P. : He recalled that he was in solitary confinement at Lubyanka. This is where he went through tough interrogations, the bright spotlight, grooming questions, death threats. The KGB interrogation team was trying to crack and to break him and have him collaborate. There was no physical torture though. But throughout this ordeal my father didn’t give away any vital information, didn’t jeopardize other U-2 pilots and programs he knew about and didn’t denounce United States of America. And this is exactly why he is now awarded the Silver Star. RBTH: What did your father tell you about the spy swap that took place in Germany in 1962? G.P. : He did talk about this exchange. It was a cold, dark morning on the Glienicke Bridge in Potsdam, Germany. The Russian spy Rudolf Abel was on one side and he was on the other. Then two men walked across the bridge at the same time to their respective freedom. My father told me that he has already made his mind that if something went wrong and the exchange was called off he would jump from the bridge and take his chance to getting away because he didn’t want to go back to prison. He was that determined. RBTH: It is believed that your father’s book "Operation Overflight: A Memoir of the U-2 Incident" cost him his job, specifically because the book was quite critical regarding the CIA. Would you confirm that? G.P. : I can’t confirm that. There is no physical evidence to support that. But it is what my father believed. Within a two or three month period of him writing the book and having it published he was let go from Lockheed Martin. From what he heard from some of his colleagues who worked with him, he became a “persona non grata” for defense contractors because of his book. RBTH: Do you think your father had a chance to avoid being shot down? G.P. : No, I don’t think so given the circumstances. He was on his route and at least eight missiles were fired at his plane. And we now know that certainly he was at 17500 feet when a Soviet surface-to-air missile SA-2 hit the plane and damaged the tail section resulting in the aircraft falling to the ground. It was the wrong place at the wrong time for him and the right place and right time for the Russians. So I don’t believe there is anything he could have done to avoid it. But the mission planners could have taken him on a different route, but even then there was a chance of being shot down. The fact of the matter is that the CIA has always known that there was a chance of him being shot down and he was out of luck on May 1, 1960. RBTH: When Gary Powers got back to the U.S. he encountered a cold shoulder - a lot of people accused him of a lot of things, such as not poisoning himself, not destroying secret equipment etc. Why did it happen? G.P. : By the time my father returned home it was height of the Cold war. In America there was a red scare and McCarthyism and all sorts of such things. It was a high-profile espionage case and my dad was interrogated behind the Iron Curtain where he could defend himself. So there were a number of “political experts” in this country who came out and talked about what he should or shouldn’t have done not knowing the hard facts. It took 50 years to set his record straight. And only the progress of history and newly released materials helped shed light on what happened back in 1962.